Jeffrey Thomas is a Welsh-born New Zealand actor, best known for his television roles. He rose to prominence in New Zealand in the late 1980s with the lead role of Inspector “Sharky” Finn in the TVNZ police drama series Shark in the Park, and is also well-known for his roles in two long-running New Zealand soap operas, Mercy Peak and Shortland Street, and his distinctive voice can be heard narrating a large number of documentaries. 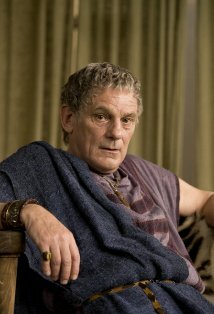 Internationally, Thomas is best known for his roles of Jason in Hercules: The Legendary Journeys and narrator in Costa Botes’s and Peter Jackson’s mockumentary Forgotten Silver. Thomas is a graduate of Liverpool University and Oxford University in England. Bilingual in English and Welsh, he is also a writer of dramatic material in both languages. He has scripted several episodes of New Zealand television programmes, and also of the Welsh drama series Mwy Na Phapur Newydd. He has also written a play, Playing the Game, which has been performed in both New Zealand and the United Kingdom, a short film (Making Money), and two books, one of them a collection of stories for children. More recently he is known for his role as Titus Lentulus Batiatus on the Starz series Spartacus: Gods of the Arena. Thomas is to reunite with Peter Jackson in the upcoming The Hobbit film production, where he’ll be playing the Dwarf King Thror. Please feel free to comment and discuss on the Forum. Thomas is to reunite with Peter Jackson in the upcoming The Hobbit film production, where he’ll be playing the Dwarf King Thror.Jeffrey Thomas is a Welsh-born New Zealand actor, best known for his television roles. He rose to prominence in New Zealand in the late 1980s with the lead role of Inspector “Sharky” Finn in the TVNZ police drama series Shark in the Park, and is also well-known for his roles in two long-running New Zealand soap operas, Mercy Peak and Shortland Street, and his distinctive voice can be heard narrating a large number of documentaries.